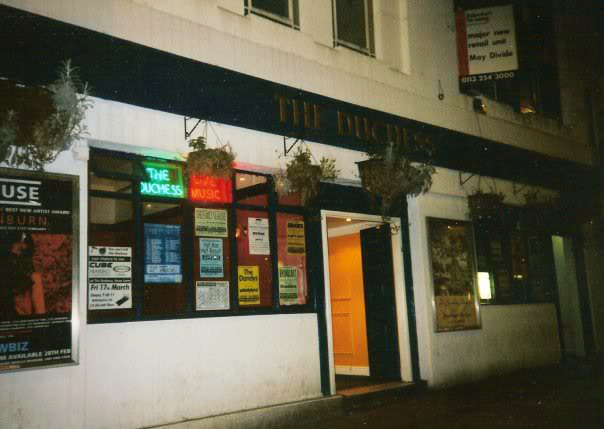 The Duchess of York on Vicar Lane in Leeds was the most happening venue, possibly in the North of England, from the late 1980’s to its tragic closure in March 2000. With sticky floors guaranteed, a well-stocked bar, providing you were only after beer or whisky, and a crowd who took absolutely no prisoners if the band was having an off-day, it was a magical place. Looking at some of the flyers now, it’s notable how many bands paid their dues by playing in this vibrant though slightly grotty pub, going on to become bigger names – in some cases (Nirvana, Oasis etc) megastars. Wallow with us in the stale beer of nostalgia.